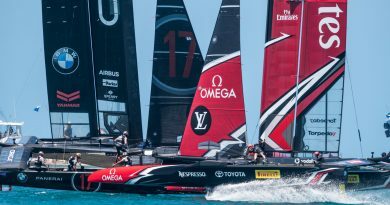 Peter Burling and Emirates Team New Zealand have won the 35th America’s Cup. Another dominant race win for Peter Burling and Emirates Team New Zealand in race nine of the America’s Cup Match, presented by Louis Vuitton, gave the Kiwi team victory on the Great Sound in Bermuda, sparking wild celebrations on board their America’s Cup Class (ACC) boat, and the team’s support boats on the Great Sound. Burling now adds the 35th America’s Cup to the Red Bull Youth America’s Cup trophy he won in San Francisco, 2013. 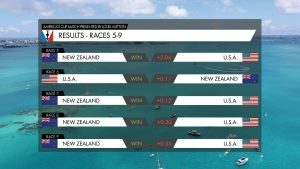 The Kiwi team dominated the final stage of the 35th America’s Cup, winning eight races to ORACLE TEAM USA’s one race win, giving the New Zealanders a final winning scoreline of 7-1. The America’s Cup was last won by a team representing New Zealand in 2000 and they are now the Defenders of the America’s Cup for the 36th installment of the competition for the oldest trophy in international sport. In the final press conference of the 35th America’s Cup, Grant Dalton, CEO of Emirates Team New Zealand, also announced that the Royal New Zealand Yacht Squadron has accepted the challenge of Circolo della Vela Sicilia, who will be the Challenger of Record for the 36th America’s Cup and will be represented by Luna Rossa. 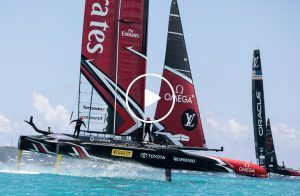 By the third mark the Challenge’s lead was up to 26 seconds, increasing further still at the fourth mark, up to 34 seconds, and from that point, barring mistakes by Burling and his all-conquering Emirates Team New Zealand crew, the die was cast. ORACLE TEAM USA managed to peg back their rivals slightly in the latter stages of the race, but New Zealand sealed their win in impressive style, crossing the finish line for the final time in the 35th America’s Cup 55 seconds ahead of the US team. “We’re just blown away. We came here to win the America’s Cup and right now we’re taking the America’s Cup back home to New Zealand. “To be able to win eight races in Beautiful Bermuda in front of a big crowd of our own fans is overwhelming, we’re just happy to be able to share this moment with them, we’re just blown away. “I’ve grown up watching this competition as a fan and to be a Kiwi and taking this Cup home is a dream come true. “To be able to win this event at such a young age is an unreal feeling. However, I’m just a tiny part of a massive team and it is incredible to be able to reward the hard work of those hundreds of people who have supported us, not only here but back home in New Zealand as well. “We’ve had to go through some incredibly tough times to get to this point. It has been an incredibly tough path to get past the rest of the challengers and then ORACLE TEAM USA and it’s credit to every team that competed. “It’s so unique to get to sail these boats, every day they can be different. Our incredible shore team gave us that edge and to be able to reward their hard work and bring this Cup home with us is an amazing feeling. “It’s just sinking in really and I think that will be the same feeling for all of those Kiwi fans watching us win the America’s Cup back home. “For me I think the reason we won was because of what happened four years ago. This team has gone through some really tough spots from San Francisco and to be able to reward this team with the America’s Cup is the best feeling, because they are such an incredible team. “I’d like to say thank you to Bermuda. 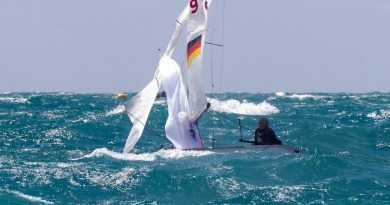 It has been an amazing venue for a sailing event and I’ve absolutely loved this place, I’d love to come back at some stage. 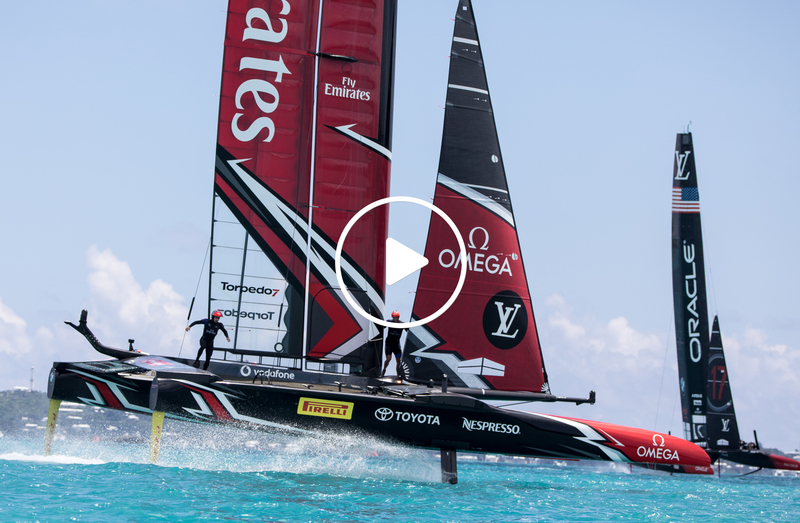 “It’s just an amazing feeling of satisfaction to have finally won the America’s Cup. “It has been an incredibly tough journey to get here. We came across late to Bermuda from New Zealand and to be able to get the boat into good shape in such short time is all credit to our amazing team. “I’m just so proud to be a part of this team and to be able to bring the Cup home and I want to thank the support of the whole country. “What happened in 2013 was a brutal experience for everyone involved, to be so close was extremely disappointing and is something that will live with all of us for the rest of our lives. “So to be able to come here a few years later and pull off an unbelievable victory has really redeemed that situation for New Zealand and it feels like justice has prevailed. “We probably don’t realise how big a deal this is back in New Zealand. I’ve been told that there was traffic jams at 4am with people trying to get to work just to see the races, which is utterly incredible. “We’ve had a phenomenal group of guys, we’ve battled some serious adversity but as a group we’ve overcome everything. There have been a lot of people behind that and none more so than Matteo De Nora, who has stuck with the team through thick and thin and believed in everything that we have done. New Zealand owes a lifetime of gratitude to him for what we have achieved. “We thought outside of the square and we did it our way. After San Francisco we knew we couldn’t out-spend other teams here so we had to out-think everyone. One of the things to come out of San Francisco is that we were out-designed and we knew this time round that we had to push that area. “This time round we had no restrictions on design. We just wanted to see what we could come up with and we have achieved some truly amazing things that have been revolutionary in this sport. “After San Francisco we had a pretty tough debrief and came up with 20 points that we had to change. One of those was that we had to invest in technology and the people that provide it. We also had to get our arms around the next generation of yachtsmen that were coming through and Peter (Burling) was one of those. “He told me he wanted to be helmsman, so it was all about investing in the right people and giving them the responsibility to go out and achieve what we knew we could. 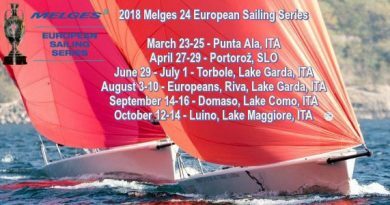 “It is important that we make the next America’s Cup affordable but we also need to remember that it is the America’s Cup and it is one of the top sports and not a little beach regatta. It is never going to be cheap. “It is a fine balance between not making it prohibitively expensive, but not being so cheap that it devalues the competition. “At the core of what we believe, we have to create an event that takes a lot of the good that has happened here, because there been a lot of good here. Just because we didn’t sign the Framework Agreement, that doesn’t mean to say there weren’t elements we didn’t agree with, it was just didn’t agree with every element. 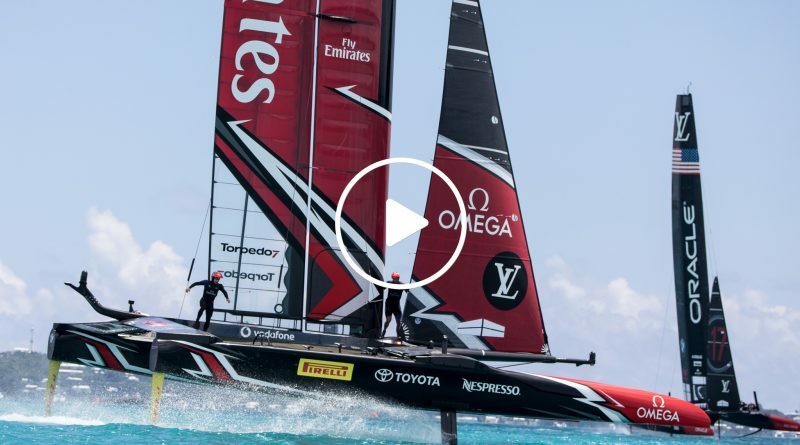 “On behalf of the whole of ORACLE TEAM USA, congratulations to Emirates Team New Zealand. What an incredible team. They’ve been a class above everyone in the 35th America’s Cup and we take our hats off to you. Well done. 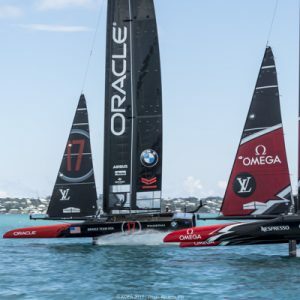 “They sailed better than anyone else out here and so, rightly so, they are the 35th America’s Cup champions. “The defeat hasn’t really sunk in yet and it is definitely weird looking at the trophy and knowing we won’t be taking it home. “With hindsight there are a lot of things you would like to change but I think it’s far too early to say what might have gone wrong. Sir Russell Coutts, CEO, America’s Cup Event Authority, was quick to acknowledge the first New Zealand victory in the America’s Cup since 2000, saying, “I would like to offer my heartfelt congratulations and praise to everyone in Emirates Team New Zealand for winning the 35th America’s Cup. “Helmed brilliantly by Peter Burling, with the guiding influence of skipper Glenn Ashby, supported by a world class sailing, design and shore team, they performed magnificently here in Bermuda, winning in dominant fashion.